Traders and financial professionals work ahead of the closing bell on the floor on the New York Stock Exchange (NYSE), October 26, 2018 in New York City. October has been a jarring month for U.S. stocks. But one strategist is calling a bottom and says it’s an opportune time to buy a few of the struggling sectors. Lee, former J.P. Morgan chief equity strategist, said the fierce drop in October has brought equities to “unusually sold-off levels.” Fundstrat examined previous, similar historical percentage drops in the S&P 500 and the Russell 2000 relative to their 50- and 200-day moving averages. Based on those trends, Lee said “the bottom is here” and predicts that equities will rally 10 percent-plus into year-end. “The prevalence of these 4 oversold conditions (50D/200D for S&P 500/Russell 2000) is a major tactical signal and we would be aggressive buyers,” Lee said. As far as which sectors to buy, Lee said what “fell the hardest will bounce the most.” In October’s sell-off, the biggest laggards were Industrials, Energy, Materials, Tech and Consumer Discretionary. “The message is to get aggressive and buy what was clobbered. And to rotate out of the Defensives,” Lee said. 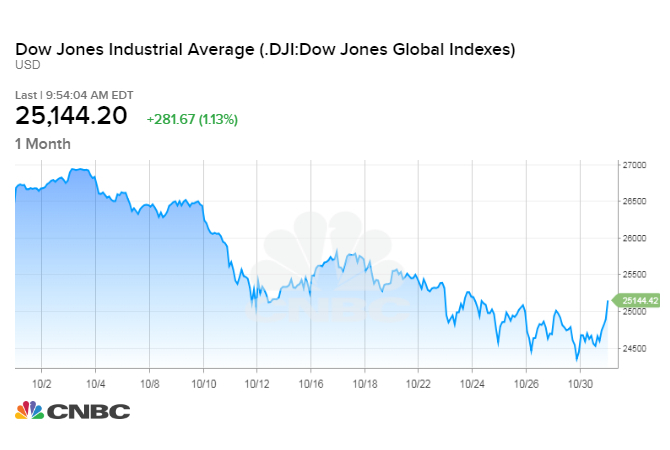 Major averages are still on pace for sharp October losses, under pressure from U.S.-China trade disputes, rising interest rates and worries about corporate earnings growth. Stocks did rise sharply Wednesday for a second straight day, helped by solid earnings from General Motors and Facebook. Lee’s quant model found 23 comeback stock candidates, including Home Depot, Boeing, Caterpillar and Microsoft.